Whether you’ve been playing World of Warcraft for years or you’re new to the game, you’ve probably noticed that instance leveling brings you levels a lot faster than solo questing. However, there are a few things you can do to level even faster, and one of the easiest ways to do it is by completing all of your instance quests. Instance quests are usually located in the general vicinity of the entrance to each instance. They can also be found in nearby towns. The best way to make sure you have all of the instance quests you can get your hands on is to travel out to the area where the entrance to the instance is. Look at all available quests and pick up the ones that reference an instance. This is much easier to do when it’s very clear what part of WoW you should be leveling in. However, it gets a little bit trickier when it comes to figuring out where to go next. Of course wandering around and trying to find all of the instance quests can be quite a chore, especially in the lower levels when the levels are flying by so fast that one or two instances will cause you to ding a couple of times. This is why it’s not a bad idea to purchase an instance leveling guide like Dugi’s Dungeon Leveling Guide. The guide will tell you where to pick up instance quests and any other quests that are a prerequisite for those instance quests. This will save you a whole lot of wandering around. An instance leveling guide will also tell you which part of WoW to play next. There are so many different parts of the game that it can be confusing figuring out which area is the right one for your character to level in. In fact, instance leveling can make power leveling go by so quickly that you see very little of any parts of the game that are outside of instances. 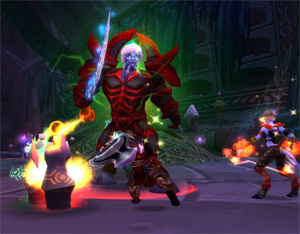 Having an instance leveling guide will help keep you on track so you always know where you need to be for each level. Another way to grab the instance quests for the dungeon you are in is to ask your party members. They can share any of their quests with you, although you will only be able to accept them if there are no prerequisite quests or if you have completed the prerequisite quests. Some players will automatically share their quests, while others may need to be reminded, but if a quest pops up in the middle of an instance, you’ll probably want to click “accept” because most likely it is a quest for the instance you are in. You can also help out your fellow party members by sharing any instance quests you have. This is a very courteous gesture that all of the other party members will appreciate.